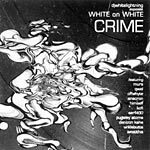 A nice compilation arranged and produced by DJ White Lightning. Features a slew of guest artists including but not limited to Qwel, Murs, Himself, Anacron, and Pugslee Atomz. Brought to you by the wonderful people over at Galapagos4!